Getting started with WooCommerce Restrictions is a breeze. In this article I'll guide you through the creation of a new Restriction. I'll also offer some suggestions about how many Restrictions you should create and what you might want to name them. The first thing you should do is provide a descriptive summary and Slug — as seen in the screenshot below. 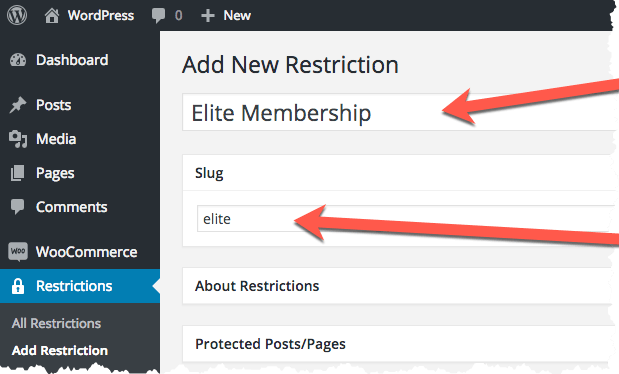 I'll go with 'Elite Membership' as an example, because I'm going to have this Restriction protect several areas of my site that can only be accessed if you're an Elite member. 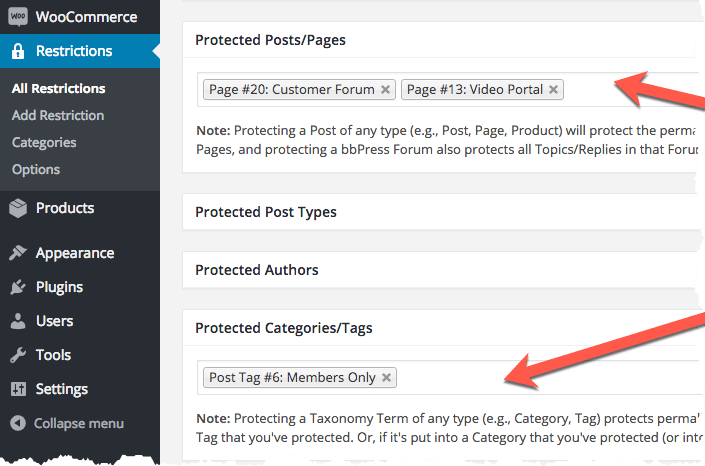 I'll protect two specific 'Pages' that I created for members only, and I'll also protect anything that I have tagged 'Members Only' already, or that I tag as 'Members Only' in the future; e.g., if I publish new Posts in the future, I can simply give them a Tag to automatically protect them. I'm also going to protect any URI on my site that begins with /member-; e.g., /member-profile, /member-directory, etc, etc. This is accomplished by protecting a URI Pattern, where ** matches zero or more characters of any kind. 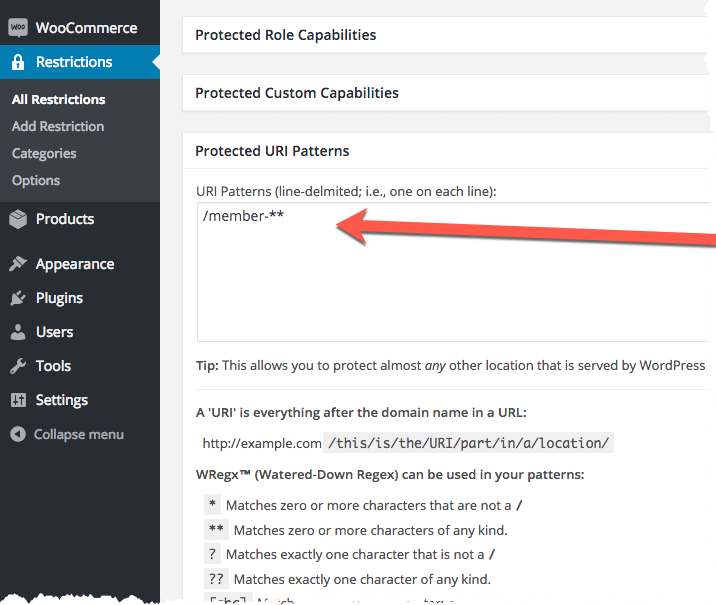 You can protect multiple URI Patterns here by adding additional lines. It's a good idea to start by creating a Restriction that protects everything that will be offered by your most expensive purchase option. So for instance, if you're going to offer Standard, Pro, and Elite membership options, start by creating a Restriction that protects everything offered to Elite members. Why start with Elite? 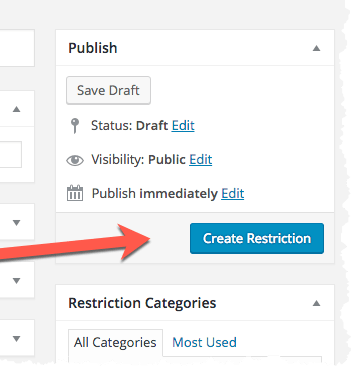 By doing it this way, your very first Restriction guards all members-only content across the entire site; i.e., everything that should be protected is now off-limits — guarded by the WooCommerce Restrictions plugin. Then, any additional Restrictions that you create can simply provide access to a limited subset of what an Elite member gets. Doing it this way is not a requirement, but it may help you get started if it's your first time creating Restrictions. So in this example I'd start by creating an Elite Restriction, then create a Pro Restriction, and finally a Standard Restriction. Elite protects everything, Pro protects (and thus, offers) a subset of what Elite protects, and Standard protects (and offers) a subset of what Pro offers. A Restriction can also be configured to protect just one or two specific things. For instance, you might find it helpful to create a separate Restriction called 'Extras'. You might have it protect (and thus, offer) one specific Page that provides access to something more; e.g., a list of additional videos that you sell. This is referred to as a Micro-Restriction. It's no different than creating any other Restriction, only you configure it to protect/offer something smaller, or more specific. Micro-Restrictions are also helpful when you want to sell existing members something more; i.e., on top of what they're already paying you for. So it's perfectly OK to create as many Restrictions as you need and break them down in creative ways that work best for your business model.